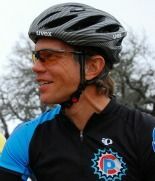 Joel Grimmett is an USAT Certified Race Director and XTERRA Regional Event Director. Joel an accomplished mountain bike and road racer, racing for over twenty years and competing in events such as the Trans Alp Challenge, La Ruta de los Conquistadores, the Leadville 100, Trans Andes Challenge, and also winning the two-man division of the 24-hrs of Adrenaline at the National Championships in 2001. Joel has also raced in the Tour of the Gila thirteen times with multiple top five GC finishes and individual stage wins. Prior to working as a race promoter, Joel devoted over 20 years to working with at risk youth. From 2001-2010, he was the executive director of a non-profit therapeutic program for at risk boys ages 13-17. Joel has served on the board of directors at Please BE KIND to Cyclist and The Friendship Alliance and is currently the President of the Fieldstone Property Owner's Association.